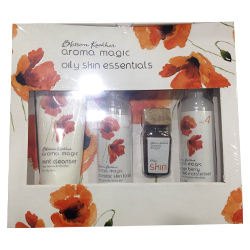 Aroma Magic Oily Skin Essentials Kit - Deep Cleanses & refreshes, tightens pores & revives skin, Reduces skin's oil secretion. Provide right solution & deliver beautiful, flawless skin. The Oily Skin Essentials Kit is a 4 step process to cleanse, nurture and balance the oil level in the skin. While the body produces oil that helps keep the skin healthy, one needs to be mindful of it too. Too much of a good thing can be a drawback. Excess oil can lead to blemishes, acne, enlarged pores and can also make the complexion dull or present an unflattering shine. Fortunately for you, our Oily Skin Essentials will provide the right solution and deliver beautiful, flawless skin. Here is a quick luxurious way to enrich and nourish the skin while removing the dirt and grime without stripping it of moisture. This kit comprises of a rich collection of mint, pomegranate, lemon and juniper berry among other skin loving nutrients. Never before has the CTM regime been complemented with an aromatherapy blended skin oil. Follow the simple steps to leave your skin soft, tone and refreshed. For best results, use our cleanser, toner, blended skin oil and moisturiser as their intricate composition complements one another in order to rebalance the oil level in your skin.